May 26, 2014 - Yes, Narconon are going to VCAT after consecutive planning recommendations against, a unanimous councillor decision against, the Warburton Police against and over 300 local resident objections against. So stay tuned folks, we're brushing off the campaign shoes and getting back into action. All previous objections are not included - so your need to write a new statement of claim - contact us for help. After 300 objections - councillors rejected the applicants unanimously 8 - 0 at meeting on Tuesday March 11, 2014. 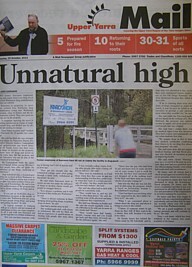 Front page of the local paper - onsite drug use at Narconon exposed - Narconon still in denial. Updated: October 22, 2013 - Ben Page at Yarra Ranges Council has provided an update on submissions. 300 - 350. We understand there is alot to count. Looking more like November 26th to go to council. Can confirm next week on Monday. Updated: October 7, 2013 - Council has received a response from Narconon to a range of issues raised by objectors at the community consultation, Yarra Ranges council and Warburton police. This response is now back with Warburton Police who will assess the information. The trigger for a decision to be made at a council meeting will now depend on when Warburton Police and Yarra Ranges Council complete their assessments of the information from Narconon. It is possible that November 12 may be decision day - we will keep you advised here. Previous updates: We're pleased with local media publicity that helps shine a spotlight on this application before council. We can advise that in addition to the 155 objection letters following Election Day efforts by the campaign team - we estimate there is now over 250 objections and counting. Every objection needs to be in writing, per person. Every objection counts as town planners must consider all objections as they assess the application on its merits. There is currently no advised decision date at a council meeting. The most likely date Tuesday November 12th onwards. Paperwork needs to be prepared approx two weeks before a meeting so it can be submitted to council management for review. Paperwork is then incorporated into an Agenda which is distributed to councillors and made available to the public before the meeting. Warburton Police were contacted by Council following the meeting of objectors after safety concerns were raised. Warburton Police have made a submission that is now with the applicants. The applicants need to complete all Council requests for more information before paperwork for a meeting of councillors can be drafted. Important message now is that concerned residents can still make submissions until the decision is made by council. Find out how to make your submission. Your submission must be based on how the use of Green Gables as an education/ drug and alcohol rehabilitation program will affect you. Advice from the (anecdotally regarded as poorly stage managed and slightly shambolic) meeting of objectors at the Warburton Golf Club on Thursday August 22, 2013 is that the council will decide on this in the next month or two. So make your submission now! We need every voice to be heard, we need every argument to be made, we need to flush out the words and submission that will help overturn this application. 'Is this the legacy we will leave Warburton? Will we place drug addicts and alcoholics beside a primary school, in the midst of residents. Will we permit Narconon to be relocated away from the isolation which is their best asset, into an area where Narconon 'students' have easier access to distractions, to leaving, to failure." When council officers and councillors go to bed at night, safe in their homes, will they be thinking of you or how you feel with the facility they approved beside you? Say No to Narconon Warburton is pleased to receive the ruling from VCAT refusing the appeal lodged by the Association of Better Living against the Shire of Yarra Ranges (Case P758/2014) on 5 February 2015. (Linked here.) Throughout this process Warburton community group Say No to Narconon (SNTN) has been involved in this hearing as a vital and affected third party.